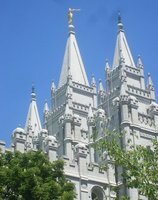 Salt Lake City is the capital and largest city in Utah, with over 2.2 million inhabitants living in the metropolitan area. The city itself has almost 200,000 inhabitants. Internationally, the city was the focus of attention during the 2002 Winter Olympics and has been getting more and more popular since then with foreign visitors as well. Notable neighborhoods in Salt Lake City include Downtown, the financial core and home to Temple Square (a two-block complex that includes the LDS church headquarters, the Salt Lake Temple, and various other sites related to Mormon history and culture); Central City, a mostly residential area from approximately 400 South to 900 South; Sugar House, a commercial/residential district in the southeastern corner of the city, known for its funky shops; The Avenues, a historical neighborhood with many old buildings, northeast of downtown; University, the area around the sprawling University of Utah campus and the adjacent Research Park, VA Medical Center, and Fort Douglas; Federal Heights, a small, affluent neighborhood in the hills east of The Avenues and north of the University; East Bench or Foothill, a residential neighborhood between 900 South and I-80, bisected by the major arterial road Foothill Boulevard; Capitol Hill, an affluent sloping district north of downtown, topped by the Utah State Capitol building; the Marmalade District, a quirky area immediately west of Capitol Hill with some unusual architecture and decor; Rose Park, a residential neighborhood northwest of downtown, near the airport; and Glendale, a heavily Hispanic residential district and home to the International Peace Gardens, at the southern end of the westside. The benches refer to a handful of residential, upper-class communities along the slopes of the Wasatch Mountains on the east side of the valley, and to a lesser extent on the Traverse Mountains at the southern end of the valley and the Oquirrh Mountains on the western side. The predominant economic divide in the Salt Lake Valley is between the eastern and western halves, with the east side traditionally being more affluent and conservative. The Wasatch Front is the urban strip located along the western edge of the Wasatch Mountain Range. It comprises everything from approximately Brigham City in the north to Santaquin in the south, anchored by the cities of Ogden in the northern half, Provo-Orem in the south, and the Salt Lake Valley dividing the two. The vast majority of Utah's population lives in this region. Significant suburbs of Salt Lake City include Sandy in the southern Salt Lake Valley, Murray and Midvale in the center of the valley, and South Salt Lake and Millcreek on the southern border of Salt Lake City proper. The western portion of the valley has some very large suburbs such as West Valley City, West Jordan, and South Jordan. Holladay and Cottonwood Heights are smaller towns in the east benches. Utah State Capitol, 350 N State St (just north of downtown), ☎ +1 801-538-3074. M–F 7:00am–8:00pm, Sa Su 8:00am–6:00pm. The grand state capitol building is prominently displayed on the mountainside, in a lovely park overlooking Downtown. The grounds include a reflecting pond and several memorials. Inside are large open areas and monumental architecture. On weekdays, guided tours are available at no charge on the hour. All publicly accessible areas are free. Salt Lake City has a moderately continental climate with relatively dry conditions throughout the year. Summers last from June to early September with especially July and August seeing high average daytime temperatures of more than 30 °C. May/June and September/early October are much better and equally good given the fact that it's almost completely dry during these months and there is a lot of sunshine. Average precipitation is just over 400 mm and snow is possible from November to April, with most of it falling from December to mid-March. Temperatures during winter are slightly above zero during the day and below zero at night, though higher up the mountains temperatures drop significantly and snowfall is much higher. Salt Lake City International Airport (IATA: SLC, ICAO: KSLC, FAA LID: SLC) is the major airport in Utah and is located several miles west of downtown Salt Lake City. It handles over 20 million passengers a year, mainly by domestic flights though there are still quite a few international connections. The California Zephyr, operated by Amtrak, travels between Chicago and Emeryville (San Francisco), stopping en route in Salt Lake City. Greyhound travels primarily on Interstate 15 (San Bernardino-Las Vegas-St George-Salt Lake City) some variations of the route continues to Los Angeles, San Diego or Long Beach from San Bernardino; 80 (Salt Lake City-Reno-San Francisco & Salt Lake City-Laramie-Cheyenne-Denver) on two separate routes; 84 (Portland-Boise-Salt Lake City) and US Hwy 40 (Salt Lake City-Denver). Passengers transfer in Boise, Denver, Las Vegas, Sacramento, Portland and San Bernardino to get to other destinations. Salt Lake Express, Salt Lake City International Airport (Load in the Passenger Drop off Lane (Middle Lane): Terminal 2 Door 11 for Delta & Skywest (Delta Connection). Terminal 1 Door 5 for all other airlines. Call and pre-arrange for pick-up or drop-off at the Ogden Airport. ), ☎ +1 208 656-8824. Travels mainly along I-15 Corridor between Las Vegas, St George, Salt Lake City, Pocatello, Butte and Great Falls, Montana. They also have additional routes across Idaho between Boise and Pocatello. From Idaho Falls they go to West Yellowstone, Montana, and to Jackson, Wyoming, via Rexburg. From St George there is another route to Zion National Park and to Marble Canyon & Page in northern Arizona. TUFESA Bus Lines, 152 State St, Orem, ☎ +1 801 822-0844. Tufesa travels primarily on Interstate 10/15 (Los Angeles-Ontario, CA-Las Vegas-St George-Orem). Passengers transfer in Los Angeles, Las Vegas, or Ontario to continue to other cities in the U.S. or Mexico. Utah Transit Authority (UTA), ☎ +1 801-743-3882. Operates the local commuter buses, which can bring you into the city from anywhere on the Wasatch Front. The Utah Transit Authority (UTA), +1 801-743-3882, operates an extensive network of bus lines that collectively reach the entire Wasatch Front, with especially comprehensive service in and around Salt Lake City. Almost all light rail stations in the valley are connected to bus routes. Only a select handful of important routes operate at night or on Sundays and holidays, and even nighttime routes usually end service around midnight or 1AM. Extra bus lines run during the winter, serving four ski resorts in the canyons east of the city, in the Wasatch Mountains. One-way fares are $2.50, or a day pass, valid on both buses and light rail, is $6.25. UTA's light rail system, TRAX, connects many of Salt Lake City's most popular tourist destinations, including Temple Square, Downtown, the University of Utah, and the airport. There are three lines, designated by the colors blue, red, and green. The Blue Line begins in Downtown at the Salt Lake City Intermodal Hub (the bus and train station) and serves Vivint Smart Home Arena and Temple Square before turning onto Main Street, where it heads south through the City Creek shopping center, past the Gallivan Plaza, and eventually toward Murray, Sandy, and Draper. The Green Line begins at the airport, heads east down North Temple Street and meets up with the Blue Line at the Arena, then runs alongside the Blue Line until South Salt Lake, where it splits off and heads into West Valley City. The Red Line serves the University of Utah campus on the east bench, then heads west to Downtown where it shares a few transfer stations with both the Blue and Green lines. The Red Line shares track with the Blue Line as far south as Murray, then splits southwest into West Jordan and terminates in the Daybreak neighborhood of South Jordan. There is also a streetcar line, the S-Line, which connects the Central Pointe light rail station in South Salt Lake to the Sugar House neighborhood. Fares for TRAX are the same as for buses: $2.50 one-way, $5 round-trip, $6.25 for the intermodal day pass. Much of Downtown and its immediate areas can be explored on foot, though expect to take the occassional bus or light rail. GREENbike has a bike sharing program with stations throughout downtown, for $5/24 hours. While not known as a hotbed of culinary innovation, there is one delicacy that originates from Utah: fry sauce, a condiment made by mixing ketchup and mayonnaise, sometimes with seasonings depending on the recipe, and eaten on French fries, onion rings, etc. Fry sauce was created decades ago by the local fast food chain Arctic Circle and can now be found in burger joints throughout Utah and in portions of neighboring states. Even national chain restaurants usually have fry sauce at their Utah locations, and many give it out as the default condiment at the drive-thru if you don't ask for something specific. Aristos, 224 South 1300 East, ☎ +1 801-581-0888, e-mail: aristo@aristosslc.com. Traditional and contemporary, farm-to-table Greek cuisine. $40–60. Bambara, 202 S Main St (Inside the Hotel Monaco), ☎ +1 801-363-5454. M–Th 7AM–10PM, F 7AM–10:30PM, Sa 8AM–11AM 5:30PM–10:30PM, Su 8AM–2PM 5:30PM–9PM. Upscale dining in the New American style, with eclectic décor and top-notch service. Has gluten-free menus for lunch and dinner hours. $25–50. Blue Plate Diner, 2041 S 2100 E, ☎ +1 801-463-1151. 7AM–9PM daily. Funky décor and fixtures collected from historical restaurants whenever one closes in the neighborhood. Serves breakfast all day, and, unlike most diners, Blue Plate has plenty of vegetarian options. Expect crowds and noise on weekend mornings. Brewvies, 677 S 200 W, ☎ +1 801-322-3891. Cinema pub with two movie screens and a lineup of mostly recent releases. Menu consists of things like pizza, burgers, nachos, and chicken tenders; drinks are mostly beer, including many local brews. Food bought at Brewvies can be eaten in the theater areas. Bucket O' Crawfish, 1980 West 3500 South, Suite #104, West Valley City, ☎ +1 801-419-0900. Louisiana-inspired sauces with a West Coast Asian twist. $10–25. Cannella's, 204 E 500 S, ☎ +1 801-355-8518. M–Th 11AM–10PM, F Sa 11AM–11PM. Fine Italian dining in a cozy atmosphere. Offers a full bar with plenty of wines. $15–30. Cedars of Lebanon, 152 E 200 S, ☎ +1 801-364-4096. Serves Lebanese and Moroccan food; has belly dancers on Friday and Saturday nights. City Cakes & Cafe, 1000 South Main St., ☎ +1 801-359-2239, e-mail: contact@citycakescafe.com. M-Sa 8AM-8PM, Su 9AM-4PM. Delicious vegan bakery and cafe, with friendly staff. $5. The Copper Onion, 111 E. Broadway, Suite 170, ☎ +1 801-355-3282, e-mail: info@thecopperonion.com. An American restaurant. Food sourcing is local and sustainable whenever possible. $30-50. Faustina, 370 E 900 S, ☎ +1 801-746-4441. $20-40. Forage, 454 East 300 South, ☎ +1 801-708-7834, e-mail: info@foragerestaurant.com. Dinner consists of a multi-course tasting menu. Dinner generally lasts 2.5 hours. $89. Hong Kong Tea House and Restaurant, 565 W 200 S, ☎ +1 801-531-7010. Tu–F 11AM–9:30PM Sa Su 10AM–9:30PM. Serves excellent Chinese food. Instead of ordering individual meals, the entire party orders appetizers. Ichiban Sushi, 336 S 400 E, ☎ +1 801-532-7522. M–Th 5PM–10PM, F Sa 5PM–11PM. Sushi and tofu in a former Lutheran church. Indochine Vietnamese Bistro, 230 South 1300 East, ☎ +1 801-582-0896. Vietnamese cuisine. The Kathmandu, 212 S. 700 E., ☎ +1 801-355-0454, e-mail: info@thekathmandu.net. Nepali and Indian cuisine. $15–30. Log Haven, 6451 E. Millcreek Canyon Rd (Located in a historic 1920s cabin in picturesque Millcreek Canyon. ), ☎ +1 801-272-8255, e-mail: info@theparis.net. New American cuisine. $25–60. Market Street Grill, 48 W Market Street (340 S), ☎ +1 801-322-4668. Breakfast: M–F 6:30AM–11AM, Sa 8AM–12PM; Su Brunch (special menu): 9AM–3PM; Lunch: M–F 11AM–2PM, Sa 11:30AM–3PM; Dinner: M–Th 5PM–9PM, F 5PM–9:30PM, Sa 4PM–9:30PM, Su 4PM–9PM. Long menu with an emphasis on seafood, but plenty of options for all times of day. Moochie's Meatballs & More, 232 E 800 S, ☎ +1 801-596-1350. M–Sa 10:30AM–8:30PM. Sandwich joint specializing in Philly cheesesteaks and meatball subs. $8–15. Pago, 878 S. 900 E., ☎ +1 801-532-0777, e-mail: info@theparis.net. Fine eclectic dining built around a farm-to-table ethos. Make your reservation online. $20–60. The Paris — Bistro and Zinc Bar, 1500 South (Emerson) 1500 East, ☎ +1 801-486-5585, e-mail: info@theparis.net. French cuisine. $20–50. The Pie Pizzeria, 1320 E 200 S (next to the University), ☎ +1 801-582-5700. M-Th 11AM-1AM, F Sa 11AM-3AM, Su noon-11PM. Two locations around the corner from each other: one for take-out only and then a dine-in location in a dark but cozy basement with twenty years worth of graffiti covering the walls. Best known for their giant, thickly loaded pizzas, but they also serve salads, sub sandwiches, and beer. $6-20. The Red Iguana, 736 W North Temple, ☎ +1 801-322-1489. M–Th 11AM–10PM, F 11AM–11PM, Sa 10AM–11PM, Su 10AM–9PM. Award-winning Mexican restaurant with a menu based on old family recipes. Popular and crowded enough that they have a second location less than two blocks away (866 W South Temple, +1 801-214-6050) and an express version called Taste of Red Iguana a mile east on the State Street side of the City Creek Center mall. $10–20. Red Rock Brewing Company, 254 S 200 W, ☎ +1 801-521-7446. Su–Th 11AM–11PM, F Sa 11AM–midnight. Downtown brewpub popular for their seafood dishes from Almond Crusted Trout to simple fish and chips. More focus on the food than you might expect from a place that calls itself a brewery. $10–25. Rodízio Grill, 600 South 700 East 2nd Floor (Located in Trolley Square. ), ☎ +1 801-220-0500. Brazilian churrascaria. $27. Ruth's Diner, 4160 Emigration Canyon Rd (in Emigration Canyon, about two miles east of Hogle Zoo and This is the Place), ☎ +1 801-582-5807. 8AM–10PM daily. Open since 1930, Ruth's features a unique mountain setting and creekside patio seating. The diner is famous for its large "mile high" biscuits. Sunday brunch tends to be very busy. Siegfried's Delicatessen, 20 W 200 S, ☎ +1 801-355-3891. Authentic German deli in the heart of downtown. $5–15. Spencer's for Steaks and Chops, 255 S West Temple (northeast corner of the Hilton), ☎ +1 801-238-4748. Lunch: 11AM–2PM; Dinner: 5PM–11PM. Upscale steak restaurant. Voted "best steakhouse" by Salt Lake Magazine eight years in a row. Squatter's, 147 W Broadway, ☎ +1 801-363-2739. M–Th 11AM–midnight, F 11AM–1AM, Sa 10AM–1AM, Su 10AM–midnight. Tasty local brewpub with a nice patio. Texas de Brazil, 50 S. Main St. Suite 168 (Located in City Creek Center. ), ☎ +1 385-232-8070. Brazilian churrascaria. $43. Himalayan kitchen, 360 S State St, Salt Lake City, UT 84111 Delicious Momos and Nepali/Indian curries. The state of Utah has a reputation for unusual and frustrating laws regulating the sale of alcoholic beverages. This reputation was well earned as recently as the late 2000s, but the state has made a series of reforms since then and the situation isn't as bad as you may have heard: you no longer have to sign up for a club membership just to enter a bar, for example. Beer sold in grocery stores and convenience stores is a bit weaker than in other states: 3.2% alcohol by weight (4% by volume). This is also the maximum alcohol content for bars with beer-only licenses, or "taverns"; stronger beer is regulated as if it were a hard liquor. An establishment with a restaurant liquor license is not allowed to serve alcohol to you unless you signal an intention to order food as well. A special law had to be passed so patrons could order their drinks before they finish looking at the menu. Mixed drinks sold in restaurants are limited to 1.5 ounces of any one spirit plus up to one ounce of additional liquors (and any amount of non-alcoholic additions). Bars and restaurants alike can only serve beer between 10AM and 1AM; wine and cocktails are limited to noon through 1AM. Retail sales of wine, spirits, and "heavy beer" (over 3.2% alcohol by weight) are limited to dedicated liquor stores. In more populous areas, these are mostly a chain of government-owned outlets called the State Liquor and Wine Store. Locations downtown include one at 205 W 400 S (+1 801-533-5901) and one at 255 S 300 E (+1 801-533-6444). The wine prices vary significantly, but the store must sell the wine for at least 67% above cost (beer 75% above cost) plus state taxes. You cannot buy wine openers at the wine stores, so bring your own or be prepared to buy one somewhere else. The selection of wine is fairly large, but the selection of spirits is quite small and centered around "premium" spirits. There is also no case discount available. The Bayou, 645 S State St, ☎ +1 801-961-8400. M 11AM–midnight, Tu-F 11AM–1AM, Sa 5PM–1AM, Su 5PM–midnight. A beer lover's paradise with over 300 different beers from all over the world, about 30 of them on tap. The food menu features Cajun and Creole dishes like Jambalaya Pizza, Alligator Cheesecake, and Blackened Catfish Salad. Live music after 9PM on most Friday and Saturday nights. Fiddlers Elbow, 1063 E 2100 S, ☎ +1 801-463-9393. M–Th 11AM–11PM, F 11AM–midnight, Sa 9AM–midnight, Su 9AM–10PM. Sugarhouse sports bar that takes on a laid-back bar & grill atmosphere between games. Standard American food: burgers, pizza, etc. Gracie's, 326 S West Temple, ☎ +1 801-819-7565. M–Sa 11AM–2AM, Su 10AM–2AM. Stylish two-story gastropub popular with the younger crowd. Has a patio on each floor and beautiful views of both downtown and the mountains. Live music most nights, not just on weekends. Must be 21 or older. $10–30. The Woodshed, 60 W 800 S, ☎ +1 801-364-0805. 5PM–2AM daily. The Woodshed is a friendly, fun neighborhood dive with a touch of class and good spirits. Featuring live local music and karaoke and comfortable atmosphere with a large outdoor patio. Smoker friendly with a firepit for the winter and a backyard for the summer nights filled with live music and great times. Anniversary Inn, Two locations in Salt Lake City: 678 East South Temple and 460 South 1000 East, toll-free: +1-800-324-4152. Themed rooms (e.g., train car, Phantom of the Opera, country garden) make this a unique, fun, and slightly offbeat option. $199. Carlton Hotel Inn & Suites, 140 E South Temple, ☎ +1 801-355-3418, toll-free: +1-800-633-3500. Near Temple Square and City Creek Center. Hotel exterior is beautiful — hotel interior is functional, but a bit like a 1980s office. DoubleTree Suites, 110 W 600 S, ☎ +1 801-359-7800. From $135. Grand America Hotel, 555 S Main St, ☎ +1 801-258-6000, toll-free: +1-800-304-8696. A landmark high-rise on the south end of downtown, intended to be "the best hotel ever built". The five-diamond hotel features a lovely courtyard and some of the most elaborate chandeliers and mirrors in the world. $180–330. Haxton Manor, 943 East South Temple, ☎ +1 801-363-4646, toll-free: +1-877-930-4646, e-mail: innkeepers@haxtonmanor.com. A luxurious boutique hotel with "a little bit of England right here in Salt Lake City." This is probably one of the most beautiful boutique experiences in the city. Highly recommended. $120–200. Hilton Salt Lake City Center, 255 S West Temple, ☎ +1 801-328-2000. Check-in: 3PM, check-out: noon. Hotel Monaco, 15 W 200 S, ☎ +1 801-595-0000, toll-free: +1-800-805-1801. An elegant Kimpton hotel in the historic Continental Bank Building high rise. The rooms aren't large, but they are luxurious and cozy. Can be a cheaper option on weekends when it isn't in high demand among business travelers. From $109. Hyatt Place, 55 N 400 W (next to The Gateway mall), ☎ +1 801-456-6300. Inn on the Hill, 225 North State St, ☎ +1 801-328-1466, e-mail: info@innonthehillslc.com. This 11,000 square foot, 1906 Renaissance Revival style mansion is one of the grandest on Salt Lake's Capitol Hill. The mansion was turned into a lovely boutique hotel in 1998 and restored to its original grandeur in 2004. $150–235. Little America Hotel, 500 S Main St, ☎ +1 801-596-5700, toll-free: +1-800-281-7899. $95–200. Marriott City Center, 220 S State St (by the Gallivan Plaza), ☎ +1 801-961-8700. From $99. Marriott Downtown at City Creek, 75 S West Temple (across the street from the Salt Palace Convention Center and adjacent to the City Creek Center mall), ☎ +1 801-531-0800. From $99. Marriott University Park, 480 Wakara Way, ☎ +1 801-581-1000. Metropolitan Inn, 524 S West Temple, ☎ +1 801-531-7100, e-mail: frontdesk@metropolitaninn.com. Microtel Inn & Suites Airport, 61 N Tommy Tompson Rd, ☎ +1 801-236-2800. Check-in: 3PM, check-out: noon. Off-Broadway Studios, 316 S 400 E (a block east and around the corner to the north from the Library TRAX stop), ☎ +1 801-487-2729, e-mail: Off_Broadway_Studios@mail2world.com. Check-in: 3PM, check-out: 11AM. Suites with kitchens. Golf clubs and bikes available to borrow. Discounts for booking multiple units at once, up to six total. Advance booking required. $90–130 for a single-unit booking. Peery Hotel, 110 W Broadway (corner of West Temple (100 W) and Broadway (300 S)), ☎ +1 801-521-4300, toll-free: +1-800-331-0073, e-mail: reservations@peeryhotel.com. Check-in: 3PM, check-out: 11AM. An upscale boutique hotel. Large windows offer nice views of the mountains, the valley, and the city vibe. $79–139. Plaza Hotel, 122 W South Temple (across the street from Temple Square), ☎ +1 801-322-5057, toll-free: +1-800-366-3684, e-mail: rooms@plaza-hotel.com. The dated exterior looks like Soviet architecture, but the rooms are pleasant, clean and smoke free. Complimentary airport shuttle for individuals. $75–125. Radisson, 215 W South Temple, ☎ +1 801-531-7500, toll-free: +1-800-967-9033. Red Lion, 161 W 600 S, ☎ +1 801-521-7373. Check-in: 3PM, check-out: noon. $90–105. Sheraton Hotel, 150 W 500 S, ☎ +1 801-401-2000. Check-in: 3PM, check-out: noon. SpringHill Suites Salt Lake City Airport, 4955 Wiley Post Way, ☎ +1 801-532-6633. University Guest House & Conference Center, 110 South Fort Douglas Blvd., ☎ +1 801-587-1000, toll-free: +1-888-416-4075. At Fort Douglas on the University of Utah campus. $120–220. Wildflowers Bed and Breakfast, 936 East 1700 South, ☎ +1 801-466-0600, toll-free: +1-800-569-0009. This bed and breakfast, a fully renovated Victorian-era home built in 1891, is located in Salt Lake's Sugarhouse neighborhood. $90–125. The Avenues Hostel, 107 North F St, ☎ +1 801-359-3855, toll-free: +1-877-467-8351, e-mail: info@saltlakehostel.com. From $23. Camelot Inn & Hostel, 165 W 800 S, ☎ +1 801-688-6196. 18 or older, no convicted felons. Beds from $18–23 per night for one person, $34 per night for two. Utah International Hostel, 50 South 800 W, ☎ +1 801-359-4525. We have a comprehensive list of accommodation in Salt Lake City searchable right here on Travellerspoint. You can use our map to quickly compare budget, mid-range or top of the range accommodation in Salt Lake City and areas nearby. This is version 22. Last edited at 14:48 on Dec 31, 18 by Utrecht. 57 articles link to this page.